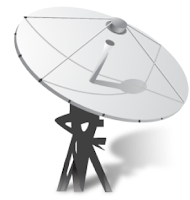 Gordon's STEM Blog: Hybrid-Terrestrial-Satellite Networks? That's what Charlie Ergen at Dish Networks is putting together and it makes sense. Ergen's a former professional blackjack player billionaire currently transforming Dish to a wireless mobile video company. An October 17-23, 2011 Business Week Companies & Industries piece titled Charlie Ergen Wants To Beam You Everything does a nice job summarizing where Ergen is taking Dish. Here's some details. Ergen moved fast with the Blockbuster acquisition, rolling out a Blockbuster branded movie streaming service to Dish customers last month. What's next? Ergen currently has a $1.9 billion offer on the books for Hulu which is currently owned by News Corp., Walt Disney and Comcast. Picking up Hulu would give Dish rights to more than one million paying subscribers. Dish also has pending deals to pick up DBSD North America and TerreStar Networks. These two companies also own wireless spectrum which could be the real prize and an indication of things to come. What the company really needs is more wireless. Access to an existing broad wireless network (DBSD and TerreStar will not be enough) is coming so watch for Ergen to go after a provider (maybe Sprint?) or maybe cut a deal with one of the other providers (Verizon Wireless or AT&T?). What about competition from companies like Netflix? Peter M. Hoffman from GHL is quoted in that Business Week piece "What Charlie's done is put together content and distribution. Netflix still has to rely on someone else's distribution to deliver its content." Adding that wireless broadband piece (that Ergen needs for video delivery) could turn Dish into a viable broadband alternative to telcos like Verizon and cable companies like Time Warner. What really excites me is the access Dish could offer rural areas where there is currently not good broadband options.